Three circular shape platforms: 12", 14", 16"
Here are some examples of glass towers. Let your imagine run or give us a call to help design the exact glass tower you need for your display. 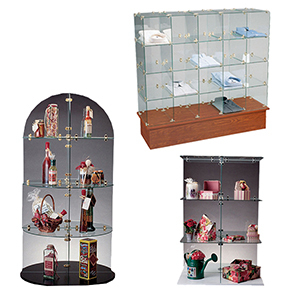 Quarter rounds, radius corners or square corners can be used as you design your own unique the glass tower display. Call us at 800-426-5708 if you need help with your design. Tempered Glass may need to be shipped VIA Common Carrier. If so you will be contacted regarding the freight on your order. There will be a crating charge of $25.00 added to each glass order.